After serving in the U.S. Army during the Korean War, Pournelle went to the University of Washington, where he explored many interests: he came out the other end with a bachelor’s degree in Psychology and Mathematics, a master’s in Experimental Statistics and Systems Engineering, and two PhDs — Psychology and Political Science. In 1970, he wrote (with Stefan Possony, who came up with the concept of the Strategic Defense Initiative, and Col. Francis Kane, who came up with the concept of the Global Positioning System) The Strategy of Technology, a textbook for U.S. military academies. But he is better known as a science fiction author — usually writing in collaboration with others, most notably Grand Master Larry Niven, a long-time This is True reader. Their books Lucifer’s Hammer (1977, which envisions what would happen if a comet slammed into Earth) and Footfall (1985, depicting an alien invasion of Earth) were best-sellers. Pournelle is notable for another innovation: in 1977, he hired a consultant to build him a home computer to use for writing, shelling out $12,000 since he figured it would make him more productive. “When he showed me Electric Pencil [word processing software], primitive as it was with only 14 lines of 64 characters on a monochrome monitor the size of a small black and white TV, I was hooked,” he said. “I earned back the $12,000 investment in under a year just with increased sales.” He then had to fight the IRS to allow the business deduction, since it couldn’t see how a writer could possibly need a computer. “It’s generally conceded that I wrote the first published book written on a computer,” Pournelle told Matthew Kirschenbaum for his book, Track Changes: A Literary History of Word Processing. Larry Niven quickly bought the same system to help their continued collaborations, as well as his own solo work. Pournelle in 2005 (Photo: G.E. Rule). With his own increasing computer knowledge, Pournelle started a regular column in Byte magazine, explaining in the first installment, “What this world needs is computer reviews by users” — in contrast to the magazine’s usual articles by programmers and computer engineers. His system, which he called Ezekiel (or Zeke, for short) after its Z-80 processor, was a guinea pig for new hardware and software, and he wrote in detail about the results. 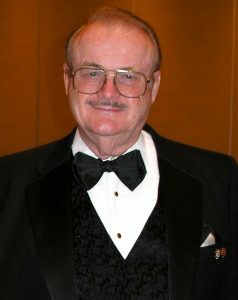 He used his “Chaos Manor” column to rail against copy protection schemes, and ridicule manufacturers who would prematurely announce releases, derisively calling their slipped delivery dates “Real Soon Now.” After Byte ceased publication, Pournelle continued writing his column on his own web site. Zeke is now in the Smithsonian — he delivered the machine to them at their request. In 2016, Pournelle received the National Space Society’s Robert A. Heinlein Memorial Award for lifetime achievement in promoting the goal of a free, spacefaring civilization. The day before he died, Pournelle started his last blog entry with a Heinlein quote: “Being intelligent is not a felony. But most societies evaluate it as at least a misdemeanor.” Dr. Pournelle died September 8, after noting in his blog that he had come home “from DragonCon with both a cold and the flu.” He was 84.